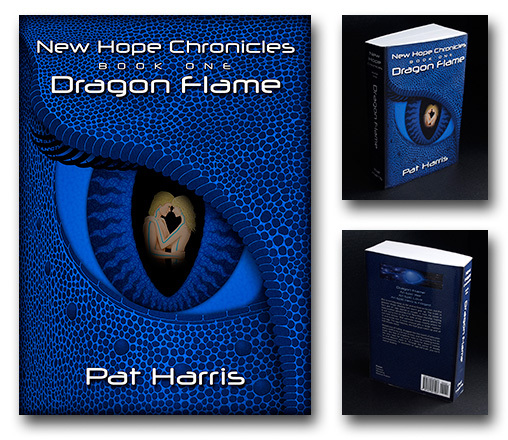 Welcome to the home of the New Hope Chronicles, an interstellar story of science fiction, fantasy, romance and faith by Pat Harris. Book One, Dragon Flame, is now available in print as a 726-page 6 x 9 inch paperback and as an ebook for the Amazon Kindle. The entire Dragon Flame tome is included in one volume so you won’t have to wait for a sequel to find out how it ends. Dragon Flame chronicles the maiden voyage of the E.S. New Hope, Earth’s first starship. The story begins with Alin. Alin is running away, as far away as he can, but galactic thugs chasing him won’t give up. The truth is he’s got an ugly secret—a couple, in fact. He takes a lowly position aboard the New Hope, hoping it will carry him to the far side of the galaxy where he can hide forever. But someone knows exactly where he is and sends him a most unusual gift—a large, mysterious egg. The egg hatches, the bad guys catch up and all hell breaks loose. Ripped out of hiding, dragged into the heart of interplanetary conflict by a brutal enemy and haunted by his secrets, the fate of kingdoms rests in his unwilling hands. His only hope for survival is a deity he doesn’t believe in—and doesn’t want to. Through the terror of deadly consequences, he discovers the age-old truth: you can’t outrun destiny. Dragon Flame – an epic war, an epic love, an epic hero is forged.